North Carolina officially passed the 10 million mark in the 2015 state population estimates, growing by more than half a million new residents since 2010. New county population estimates from the U.S. Census Bureau highlight how counties and metropolitan areas changed over this same time period. 1. Brunswick is the fastest growing North Carolina county. Coastal Brunswick County’s population grew by 14.3% between 2010 and 2015, an increase of more than 15,000 residents. Centrally located between Wilmington in New Hanover County, NC and Myrtle Beach in Horry County, SC, Brunswick draws a large number of in-migrants, particularly retirees. Its appeal as a retirement destination is evident in the drivers of population growth: since 2010, net in-migration has accounted for all of the county’s population increase; Brunswick’s relatively older population had more deaths than births between 2010 and 2015. 2. 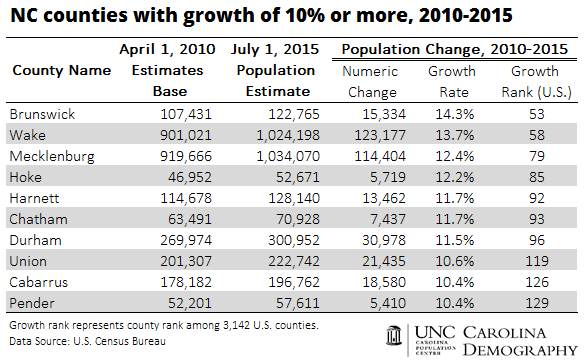 Seven North Carolina counties were among the 100 fastest-growing counties in the nation. Between 2010 and 2015, ten North Carolina counties experienced double digit population growth, with growth rates ranging from 10.4% to 14.3%. Seven of these counties were among the 100 fastest-growing counties in the nation: Brunswick, Wake, Mecklenburg, Hoke, Harnett, Chatham, and Durham. North Carolina and Florida each had 7 counties among the 100 fastest-growing, the third highest number among the states. Only Texas and North Dakota had a greater number of fast-growing counties: Texas had 24 counties among the top 100 and North Dakota had 11. 3. Wake officially passed the 1 million mark and is closing the gap with Mecklenburg, but Wake is unlikely to surpass Mecklenburg in population by 2020. Wake’s population officially surpassed 1 million, joining Mecklenburg and 43 other counties nationwide in this size class. Mecklenburg County remains larger than Wake County, although the estimates suggest Wake is closing the gap. In 2010, Wake trailed Mecklenburg by nearly 19,000 residents. As of 2015, this gap had been reduced to fewer than 10,000 people. Will Wake surpass Mecklenburg by the end of the decade? Probably not. On average, Wake has gained about 1,500 more residents each year than Mecklenburg; Wake would need to grow by an average of 2,000 or more residents each year through 2020 to close the gap and potentially surpass Mecklenburg’s population. While the gap may close, current trends suggest that Mecklenburg will maintain its edge. Forty-eight counties have lost population since 2010 due to either net out-migration, natural decrease (more deaths than births), or both factors. This is more than three times the number of counties (14) that lost population during the first five years of the previous decade, 2000 through 2005. In some counties, losses have been minimal; for example, McDowell County has experienced an estimated loss of 7 residents since 2010. In other counties, losses have been more substantial. Five counties—Bertie, Gates, Northampton, Tyrrell, and Washington—have lost 5% or more of their population since 2010. 5. Nearly half of the state’s growth since 2010 occurred in 2 counties: Wake and Mecklenburg. As an increasing number of North Carolina counties experience slowed population growth and population declines, Wake and Mecklenburg have gained a larger share of overall state population growth. Between 2010 and 2015, Wake gained more than 123,000 new residents and Mecklenburg grew by nearly 114,500. Combined, this represents nearly 238,000 people, or 47% of the state’s population growth since 2010. This release marks the halfway mark between the 2010 and 2020 censuses and highlights familiar patterns: the state’s overall growth is concentrated in the core counties of metropolitan regions; net migration plays a larger role than births and deaths in state and county growth patterns; and about half of the state’s counties have lost population. We’ll explore these estimates, and how they compare to growth in prior decades, in the coming weeks. Subscribe to the latest research from Carolina Demography. This entry was posted in Carolina Demographics and tagged counties, population estimates, population growth, U.S. Census Bureau. Bookmark the permalink.